The alarm woke me up at 4am, but that was about the only thing that did work. The cloud was broken, but there were frequent rain showers. The software wasn't being cooperative, and the computer suddenly clogged up. I managed to get a number of files but whether I can turn them into useable images I don't know. I'll post them up if I can. 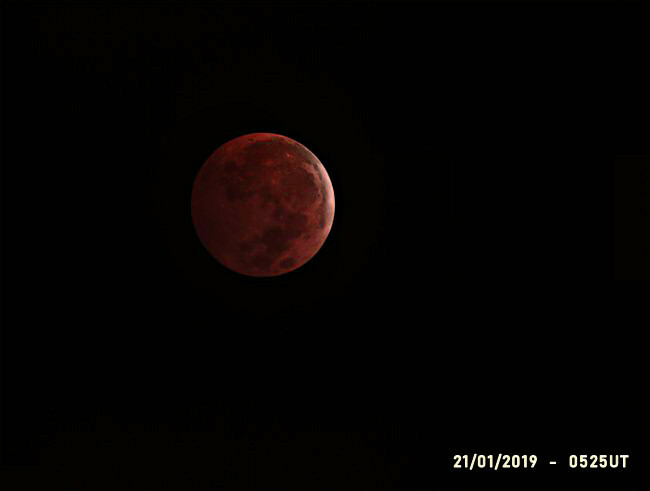 It was certainly one of the darkest lunar eclipses I've seen for a while. The central part of the moon especially seemed dark. The colour was a deep red. This sometimes happens if there is a lot of cloud on the limb of the earth as seen from the moon. 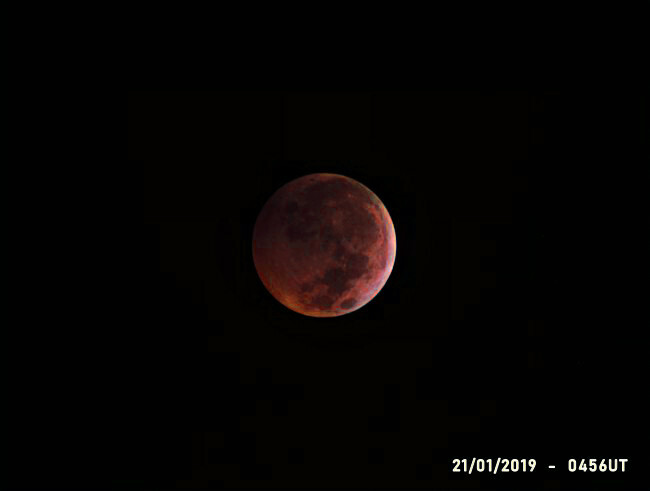 Here is a single shot I managed about 10 minutes after the moon left total eclipse. If you got any images, feel free to post them here, or start your own thread. I hope things went better for you than they did for me. Hi Aratus I like your image,I managed to get outside and get 93 images,but is was very cold. I was out for an hour and a half, and like you I got quite cold. I've been able to look through the images I got. I guess it was 4 in the morning so I made a few mistakes. The images were 'raw', and therefore I've had to put them through an additional set of processing to bring out any colour. Also I didn't save the images as cropped when they were produced, so the individual frames are larger than they needed to be. That means extra work for the computer processor, and more time. Anyhow here is the first of the images. This is taken through the guidescope so the detail is poor, but it shows the eclipse about 10 minutes before totality. Additional problems were due to cloud coming over the moon while I was taking the 400 or so frames. Only 66 frames were usable in the end. This image is pretty close to how it looked in the sky. Nice images. The conditions were just right in Kent. 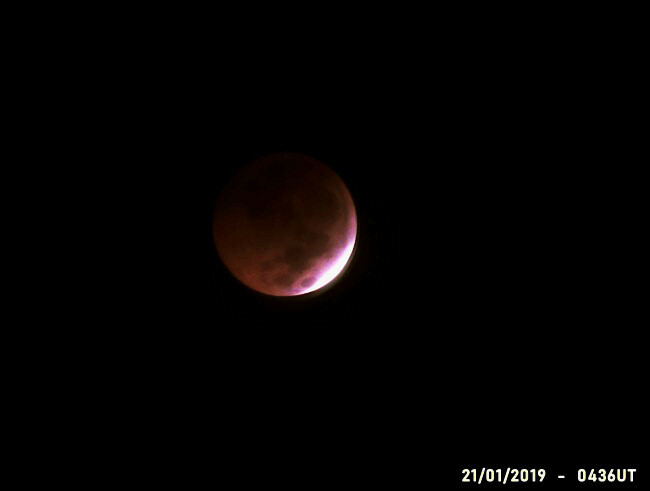 I got up at 05:00 to a deep red eclipsed Moon in a very clear sky. I watched until 06:30 on and off. Brilliant! Hi Aratus I like the image,but it was cold this morning as I could hear the frost under my feet.When I bought my scope in,it was all frosty on the inside of the dew shield. It was good to hear that Kent was clear! I nearly didn't bother to go out, but I guessed the cloud was patchy enough to give me a few seconds every so often. The rain shower was unexpected, but that is the adventage of the observatory. A tug on the rope and the aperture lid dropped down. I checked but no drops had got on to the objective lens. It has a nice long dew sheild, and of coure the telescope was pointed at a low down moon. After a few minutes it stopped and I could resume. I have a heated jacket, but my face and legs got very cold. I went inside at about 6am, expecting to go into the warm, but the central heating hadn't come on yet! The air temperature wasn't quite at freezing, but there was a frost and that rain had iced over the car windscreen. Here is the next image. This was taken about 20 minutes after the previous one, about 10 minutes into totality. This eclipse was not a very deep one, and there was a light edge at all times. One interesting feature was the lighter orangy patch about 90 degree clockwise from the ligher limb. It also appears on your image, Andrew.
. . . and the next image take about half an hour after the previous one. 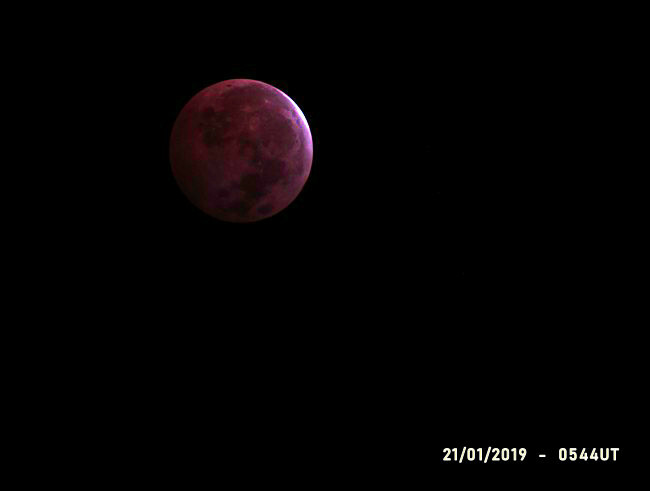 The gaps between the clouds were a bit longer this time so I got 148 frames. It is interesting to compare it with the one taken 30 minutes before. Th light rim has of course moved around further to the west. The lighter patches have also moved across to the western side of the moon. 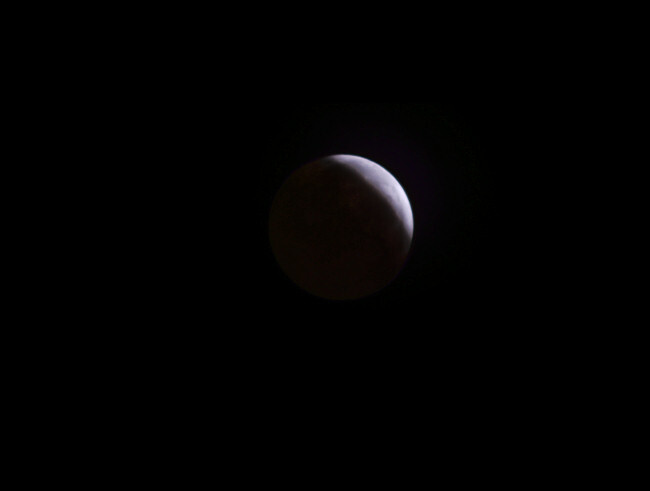 This is the last actual set of images I recorded, which was at the very end of totality. There is a hint of the 'blue edge' which is sometimes seen, especially as the sun shines through the 'violet layer' of the earth's atmosphere. I saw the light edge when I got up at 05:00 and wondered if I had missed totality! Have you seen the reports of a lunar meteorite impact during the eclipse? If you were imaging at 4:41:43 you may have caught it.